My friend thinks it might be a fun thing to make. But, like me, she’s a writer and more nimble with words than needles and thread. She has plenty to do besides sit around and match teeny pieces of cloth together and sew on buttons. Not to mention actually use the damn thing to hold pins. Pins for what? Despite happy memories of writing poems in a wood-lined room where my grandmother sewed, I was fortunate to inherit my mother’s dislike of sewing. In high school, we didn’t have a sewing machine, so I had to make place mats and napkins drudgingly by hand. I had more fun photographing and writing about them for my assignment than I did fraying 32 edges and embroidering my initials eight times. After all that work, the teacher gave me a C+ and the girls whose mothers whipped up nightgowns got As. As a young housewife with extra time on my hands, I tried sewing for awhile. I inherited my grandmother’s tiny Singer and spent hours, just as she did, bent over its whirring rattle. I made a few cute animals for my kids, but by the time I finished making skirts and blouses for myself, I was sick of them, and didn’t feel like wearing them. Eventually, as I moved into writing for a living, I gave up all pretenses of being a seamstress. 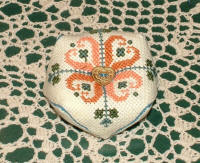 I’d rather observe and write about quirkiness than create a skewed, horny pin cushion. 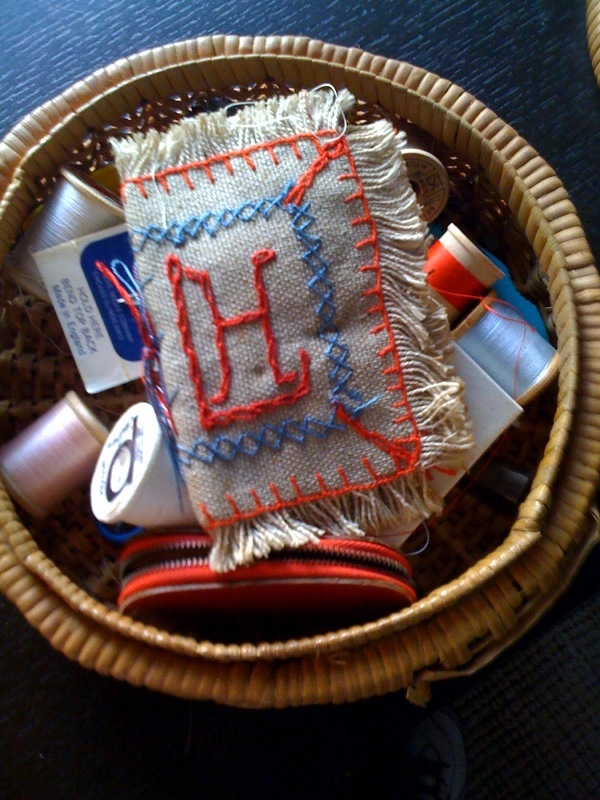 Then when my friend sent me the new pin cushion word, I remembered – didn’t I make a pin and needle holder for my mother when I was 10 years old? I still have her sewing basket. Oh yes, here it is! A tribute from one bumble-thumb to another! A loving memory of my mother, the word lover, who filled in the Los Angeles Times crossword puzzle in ink every morning until she died at 89 and avoided sewing needles like mosquitos carrying the West Nile Virus.